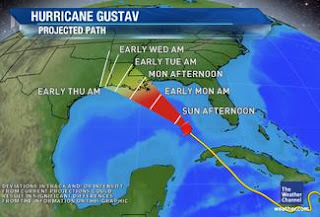 Gustav is on its way. The Weather Channel click here have some videos showing the anticipated path and talking about the storm in general. The mayor of New Orleans, Ray Nagin, has ordered mandatory evacuations and they have provided buses for those who don't have transport. To quote the mayor "But you need to be scared, you need to be concerned and you need to get your butts out of New Orleans. This is the storm of the century." Right now it has been downgraded, but it still has warm water to cross which will pump it up, possibly to the anticipated category 5. They are bringing in National Guard troops which implies they are expecting stragglers. There are always damned fools who are "going to ride it out". Mind you, I don't know and haven't been able to find out, what is happening to the towns along the coast from New Orleans. They were some of the worst hit areas with Katrina. I assume, but you know what happens with assuming, that they too are evacuating. I don't think I have any readers in the Louisiana area, but if I do, then move. I hope my pink dolphins will be OK.
A friend sent me pictures of a pink Dolphin yesterday, I was absolutely fascinated. The pictures are genuine, they have been verified at Snopes.com by me and by others. 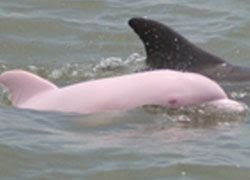 I understand it is an albino dolphin which has come out pink instead of white. It has red eyes like an albino. It is absolutely gorgeous. Some of you may have seen these pictures before, but I hadn't. What a wonderful colour. 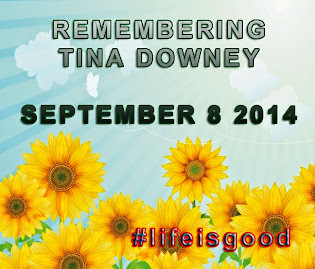 If you would like to read what Snopes has to say and to see some more pictures click here to view them. I would love to go to Calcasieu Lake, Louisiana to see this animal, quite a rarity. 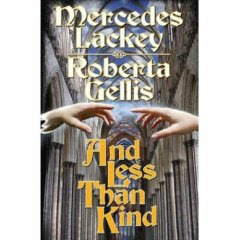 I usually love reading books by Mercedes Lackey; she has put her name to a book with Roberta Gellis, which I am currently reading (I am actually in the middle of a series and am waiting for the next two books) which is called And Less Than Kind. Its not badly written, but it is a stupid book. It is about Elizabeth I of England and her connections with Underhill where the members of the Bright Court, and coincidentally the Dark Court, exist. The Seleighe or Sidhe as they are called in many novels. Elizabeth's lover is a Sidhe who is actually there to protect her so she will eventually make it to the throne of England. I am only persevering with the book because I have nothing else to read at the moment. I am surprised Mercedes Lackey's name is connected with such a stupid story. The history of Elizabeth's survival through the reigns of Lady Jane Grey and Queen Mary is enough of an adventure without throwing in a bunch of fairies. Pah. I think one of the things I dislike is the assumption of a lover. 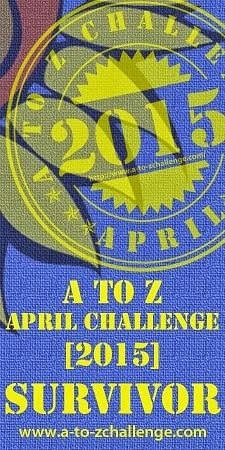 It seems to be the "thing" these days to assign lovers to Elizabeth, when nobody knows. They think she had an affair with Thomas Seymour when she was a youngster, but again, nobody knows. So to blithely allocate her a lover irritates me beyond measure. There are several others of her court who were suspected of being Elizabeth's lovers, but the same applies, no one is certain of the truth. I suppose this makes it "speculative" fiction. Its odd really because I normally enjoy stories about the Sidhe. It occurred to me last night that we start bowling again on Friday. Came around a lot faster than I expected. I am not absolutely certain whether we will bowl Friday or Monday, depends on someone else with whom I must get in touch. I persuaded her to bowl on Friday rather than not bowl at all and I can't just change our minds without letting her know. North America is a nation of beef lovers so here is a steak dish to satisfy that appetite. Antipasto Steak Salad Source - Recipe du Jour Servings: 4 Ingredients: 1 pound beef boneless top sirloin steak -- 1 inch thick 1 tablespoon freshly ground pepper 1 bunch romaine lettuce 1 cup garlic-flavored croutons 1/2 cup freshly shredded Parmesan cheese 1/2 cup Caesar salad dressing Heat coals or gas grill. Sprinkle beef with pepper. Cover and grill beef 4 to 6 inches from medium heat 15 to 18 minutes for medium doneness, turning once. Cut beef across grain into thin slices. Toss romaine, croutons, cheese and dressing. Top with beef slices. Serve with additional shredded Parmesan cheese if desired. Have a great weekend. There was a segment on Good Morning America today about someone having anonymously given their church a lottery ticket worth $3,000,000. It happened in Port Jefferson, NY. Even the pastor said he wouldn't have donated the whole win to the church. The donor is remaining anonymous. He needs to, if his family got hold of him, they would murder him, I would. Of course the news is absolutely full of Obama's acceptance speech last night, because it happened on the anniversary of the Martin Luther King "I Have a Dream" speech they are linking it together as much as they can. Personally I will be so very glad when November 4 is over as the campaigning will be finished for a little while. Unfortunately, although we are in Canada, we get it plastered all over our TV as so many of our programmes come from the States. I always hated Bush, I wonder if this guy will do any better. Had I been in the States, I would have voted for Hillary Clinton, I would love to have seen her make it to the White House. Maybe next time. We'll see what kind of a job Obama does. Mike posted a new blog last night, a beautifully written description of a morning walk during his vacation. Plus pictures of drawings he made. I wish I could write like that. The following is a simple little chicken dish I invented one day down in NC. Because Bogue is the area where we lived, that's what I called it. Unfortunately I didn't take a picture of it. Chicken Bogue Serves: 2 Source: Jo's Invention 1/2 onion chopped 4 oz mushrooms sliced 2 chicken breasts, skinned and boned 1 tomato, chopped 1 tbs of salsa, to taste 1/2 C white wine seasoning Sauté onion and mushrooms in some olive oil, add chicken and brown on both sides, then add tomato, salsa and wine allow to simmer until chicken is done. Have a great day. 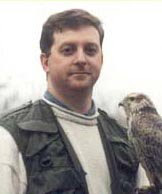 My apologies for my goof yesterday when I said Mike was holding an owl instead of a hawk. I had just never looked at the bird and had "assumed" it was his owl. We all know what assuming does. In this picture, I can say, with assurance, he is holding a sketch pad. This is actually the photo he is using on his blog and which I stole from his website. 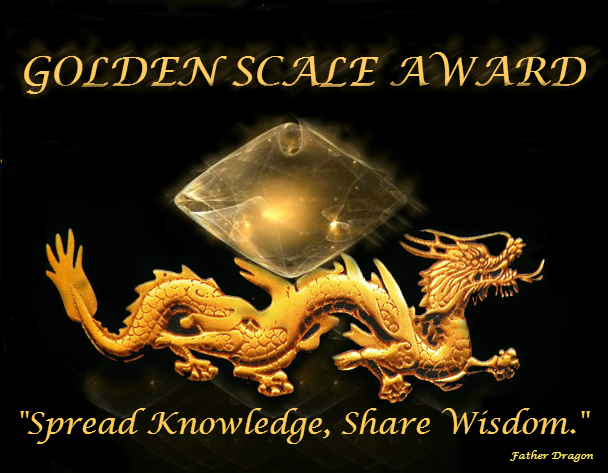 Both Mike and Glenda Larke pointed out my mistake, thanks both of you. 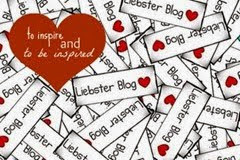 Also thank you so much to those of you who checked out his new blog yesterday, especially if you left messages. 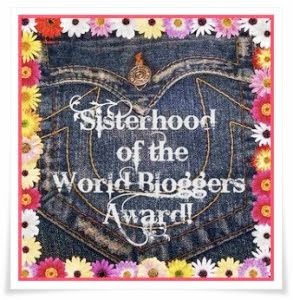 It is great encouragement if people do comment on one's blog, I know from experience, obviously. Don't forget Mike has a web site which shows his paintings too, the link for that is on this page as well. 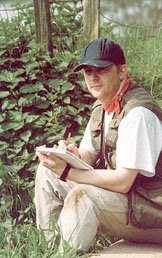 I was never very knowledgeable about English birds, shame on me, although Matt knows them very well. However, since I came to Canada, I have learned a great deal about the birds here. 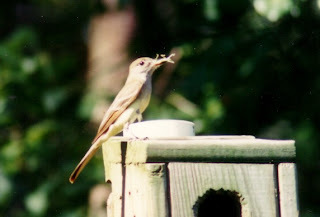 When we lived in North Carolina we had feeders and nesting boxes and spent hours watching the activities around them. On the left we have a picture of a Crested Flycatcher taking food to its youngsters. The squirrels periodically had a chew at the holes which accounts for their unevenness. 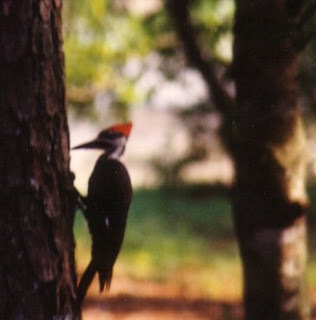 Next we have a Pileated Woodpecker. They are supposed to be pretty rare. However, they would visit our yard frequently. They particularly liked the wood we had cut for burning. I guess it was full of all kinds of bugs. We used to get lots of different woodpeckers although we don't have pictures of all of them. Some would very occasionally come and take seed from the feeders. 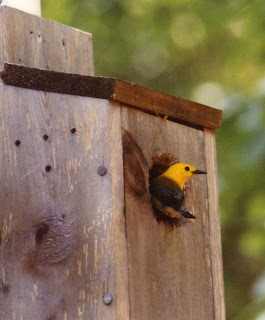 The next bird is the Prothonotary Warbler which we were thrilled to see in one of our nesting boxes as they apparently don't often nest in back yards. We also got a Bluebird nesting too and they too don't nest in backyards much either. 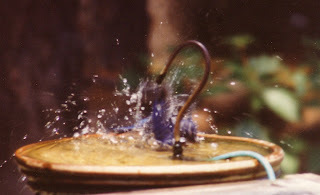 We attribute a lot of our success to the bird bath. It had a dripper on it and this apparently attracts birds like crazy. 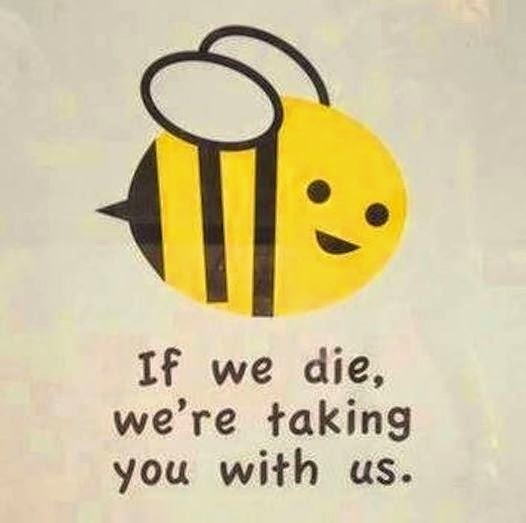 They sure liked to use ours and we got many species in our yard. We thought this was quite a funny picture of one of the birds having a rare old time giving itself a bath. Some of the birds would merely delicately sip some of the water and then fly away, others would sedately lie down in it, but as you can see, some of them really made use of the supply of fresh water. Yes, we did have to clean it quite frequently, birds are not that well bathroom trained. Finally, we didn't forget the many squirrels who visited us. Their athletic ability used to astound us and Matt was seriously thinking of entering some of them for the long jump in the Olympics. We had to cut branches down to stop them getting at the bird feeder itself. 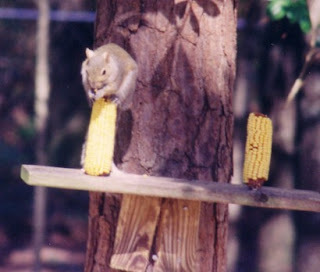 We used to love to see them eating the corn. Sometimes you would get two in between the cobs sitting back to back nibbling. Sometimes they would sit the other side facing one another and sometimes, as you can see, on top. They frequently looked like book ends. In North Carolina we only saw grey squirrels which they used to shoot (an in some areas still do) for eating. Brunswick Stew was the original recipe for stewing squirrel meat although you will rarely see a recipe using squirrel any more. I don't often give recipes for fish, but this is a good one. Baked Tuna with Coriander Crust Serves: 4 Picture: Gluten Free Girl Source: U-Cook For the salsa 1 mango, peeled, pit removed and cut into dice finely grated rind of 1 lime juice of 1 lime 1/2 red chili, deseeded and finely chopped finely grated rind of 1 lemon 1 tsp black peppercorns 1/2 small onion, finely chopped 2 tbsp chopped fresh coriander 4 X 6 oz fresh tuna steaks 1/2 cup olive oil To make mango salsa, mix the mango, lime juice, rind and chili in a bowl and leave to marinate for at least 1 hour. Mix together the lemon rind, black peppercorns, onion and coriander in a coffee grinder to make a coarse paste. Spoon onto one side of each tuna steak pressing on well. Heat the olive oil in a heavy based frying pan until it begins to smoke. Add the tuna, paste-side down, and fry until a crust forms. Lower the heat and turn the steaks to cook for a minute more. Pat off any excess oil onto absorbent paper towels and serve with the mango salsa. Have a great day. Labels: Goof, NC Birds, Squirrels, Tuna. 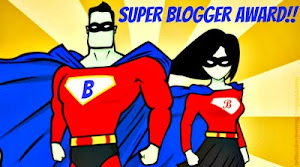 I am thrilled to tell you my son-in-law Mike, the artist, has started his own blog. The Scolopax Chronicles. No, don't know why the name, I will have to ask him. Gynie you will be particularly interested as he is including drawings and sketches of birds he has made whilst on holiday. The link to his blog is on this page, of course, so I do hope everyone will check him out on a regular basis. He is not planning to be as verbally prolific as his mother-in-law, but then he's got a life LOL. The owl in this picture is one he had for a number of years, unfortunately it died about 18 month's ago. Mike, I wish you all the best with this new venture and hope it will become really popular. They kept me pretty busy at Canadian Diabetes yesterday, I was late home and Matt asked if they paid me overtime? I am glad that I am able to help out. However, I was having a lot of trouble using MS Word on their computer today. I hope we can get that sorted out, it was doing all kinds of nasties to me. In a bit of a hurry this morning, have my appointment with my foot nurse, so I have to scoot. This afternoon I want to go to the farm we visited on the way back from my last two theatre trips, their tomatoes are absolutely delicious. Their corn was very good too. They have lots of other fresh veggies available but their cabbages were huge and so was their cauliflower. Unfortunately we would never get it all eaten before it became inedible. How about something with a South Western flavour today, I love mole sauce, but then its chocolate so why wouldn't I? Chicken Mole with Green Beans Serves: 4 Source: Cooking Light Jan/Feb 2001 4 chicken breasts, skin removed 1 lb green beans, trimmed, part cooked Cooking spray 2 tsp olive oil 1 c finely chopped onion 1 tbs chili powder 2 1/2 tsp bottled minced garlic 2 tsp unsweetened cocoa 2 tsp ground cinnamon 2 tsp dried thyme 1/2 tsp sugar 1/4 tsp salt 3/4 cup chicken broth Heat a large nonstick skillet over med high heat. Add chicken, cook 5 mins on each side. Place the chicken and beans in a baking dish coated with cooking spray and cover with plastic wrap. Microwave on high for15 minutes or until chicken is done, turn half way. While the chicken cooking, heat oil in skillet over med high heat. Add onion and the next 7 ingredients, onion through salt, cook for 3 mins or until onion is soft, stirring frequently. Add broth, and cook until thick (about 2 mins). Spoon sauce over chicken mixture. Have a great day. I have been getting emails which I thought were spam or hate mail. It turns out they are all too disturbingly true. I checked with Snopes.com. For some reason these pictures of demonstrations in London have not been shown in North America so someone started circulating them by email. If you would like to read about it and see the rest of the pictures click here and see what Snopes has to say about it all. I don't understand this. If you ever read the Koran, which I did many years ago, its message isn't really that much different to the Bible. It does seem to me that maybe Immigration people should think twice about letting such people into our countries if this is the kind of attitude they bring with them. The pictures are really quite scary. 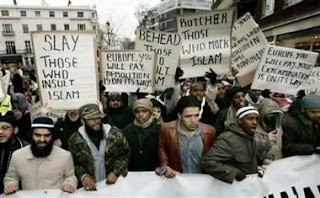 Some of them show messages saying Islam will take over the world starting with Britain. We watched a good movie last night, Just Cause which starred Sean Connery. In fact we had seen it before but had forgotten the ending. On Glenda Larke's page (Tropic Temper this page) we have been discussing villains and I would certainly select Ed Harris playing Blair Sullivan as a good villain - he was the mass murderer already on death row. You begin the movie by feeling sorry for Bobby Earl and hating the two southern cops. Sean Connery is a lawyer turned professor who is asked by Bobby Earl to help him because he is about to be executed. Lawrence Fishburne plays one of the cops we hated right from the beginning. Old movie but still a good one. We ate marinated pork tenderloin from M & M's Meat Shops last night. Can't give you a recipe and if you don't have an M & M's in your area, sorry, but it is good. This is the second one we have had and we will be buying some more. Makes a nice easy meal with a few veg. We don't usually bother with potato, rice or pasta, unless the dish really cries out for it. The only potatoes I really feel are worth eating were the ones grown on the island of Malta. European potatoes aren't bad, North American potatoes are the pits. In my opinion of course. The nearest we can find to a good potato is a Yukon Gold which has a golden tinged flesh, but they are not as good as some of the potatoes of Europe. My opinion of course. 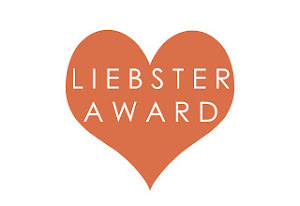 We have a big scare on in Canada at the moment, one of our deli meat producers, Maple Leaf, have recalled hundreds of their ready to eat products due to some of them being infected with listeriosis (often called just listeria) which can make you very ill and has already caused six deaths which have been confirmed. This is going to really hurt the company, they are already losing millions of dollars and of course the trust they have built up over the years has all been blown away. There are more suspect deaths but they are not yet confirmed as part of the listeria problem. Having done a bit of reading last night, it appears my packet of Canadian bacon is OK as it isn't being recalled, nor is it something one eats straight from the packet - it has to be cooked. Matt says I should ditch it anyway, but why waste money if it isn't necessary, besides, I enjoy my Canadian bacon for breakfast. The picture shows one of the many lunch meats processed by Maple Leaf Co. If you are interested, and particularly if you are a Canadian buyer of Maple Leaf processed foods, there is an extensive list in PDF form on the Maple Leaf website. Now how about a recipe with nice processed meats in it? LOL. I basically don't use them anyway so you're OK. 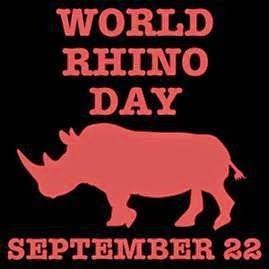 Anyway, I'd better get cracking, its my afternoon at the Canadian Diabetes Association today so I had better stop rabbiting on. I have a third filling for crèpes which came with the original recipes I posted the other day, so I thought you would like to have it. Soufflèed Spinach Crepes Serves: 6 Source: Cooking Light - May 1994 1/4 cup plus 1 tbs grated Parmesan, divided 3 tbs fine dry breadcrumbs 1 tbs margarine or butter, melted 2 tsp margarine 1/2 cup minced onion 1-1/2 tbs flour 2/3 cup skim milk 1/4 tsp salt 1/8 tsp white pepper 1/8 tsp ground nutmeg 1/2 10 oz package frozen chopped spinach, thawed and drained. 1 egg yolk 3 egg whites 1/3 tsp cream of tartar 12 Parmesan crepes Pam Combine 3 tbs of Parmesan, breadcrumbs and 1 tbs margarine; stir well and set aside. Melt 2 tsps margarine in a small saucepan over medium heat. Add onion and saute 2 mins, or until tender. Add flour and cook 1 min stirring constantly with a wire whisk. Gradually add skim milk, stirring constantly. Cook 1 min or until thickened. Stirring. Add remaining parmesan, salt, white pepper and nutmeg. In a food processor put sauce and spinach, process until smooth. Add egg yolk; process til smooth. Beat egg whites (at room temp) and cream of tartar at high speed until stiff peaks form. Gently stir in a quarter of the egg white into the spinach. Gently fold remaining egg white into spinach. Spoon 1/4 cup mixture into each crepe, fold in quarters. Arrange in baking dish coated with pam. Spread breadcrumb mixture over evenly. Bake uncovered at 375 for 20 mins. Serve with sliced tomatoes. Have a great day. I was all set to watch the appearance of two moons (one actually being Mars) on Wednesday and now I find it is a false rumour which has been circulating for years. Grrrr. I guess I was well and truly taken in, I hope no-one else was. I find Snopes to be a very useful website. I get a lot of emails which I am pretty sure are not true and check them out on Snopes every time. I wish more of my correspondents would do so. There are some emails which have been circulating for years and someone always gets taken in by them. I find there are more and more emails arriving, most of which get caught by my Spam filter, purporting to come from British banks or lottery corporations telling me how much money I have won. What scares me about these is that there are people out there who are gullible and can be conned into believing this stuff and end up losing money to these unscrupulous people. I am sure we have all received such emails. The sexual type of Spam worries me less, except that again, there are people who will be taken in and spend money on these products which will enlarge the male member or do similar wondrous things. Although, being female, I often wonder why they send me such stuff *g*. The only picture I could think of to go with this section would be most unsuitable. We had a very enjoyable dinner on Saturday night. We discussed all the problems of the world and how to put them right and ate roasted beef with red cabbage and barbecued Vidalia onions as well as stuffed potatoes. This was then followed with a warm cake loaded with warm blueberries and dolloped with cream which was delicious. Our dessert seemed to have more blueberries than this picture which doesn't have any cream either. This picture from Anusha Raji. I didn't know I liked blueberry cake, I had better forget I do as it is not good for either my diet or my diabetes. Talking of diet, its been a struggle, but I have now lost 18 lbs which means I can wear a couple of things I haven't been able to for a while. It is so slow these days, they say it is more difficult when you are older, I cannot imagine why that should be. I am also told medications can slow the weight loss process down too, if that is the case then I am (use any word which seems appropriate) out of luck. Some of you from further afield are going to wonder what Vidalia Onions are, right? They are a sweet onion which originated from Georgia in the States. Absolutely delicious and some people can eat them like apples. I am not far from it. The advertising slogan says that the only thing that makes you cry with a Vidalia onion is when they've gone. They can cause the odd tear or two, but nothing like most onions. 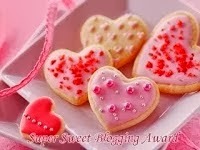 Picture from sweetonion.com. I have described in a previous blog how we cut these onions almost in quarters (don't cut right through) sprinkle with salt and a knob of butter, wrap them in tin foil and cook on the barbecue til done. Probably about half an hour, its one of those things you have to experiment with, obviously it depends on the size and how much heat, etc. However, if done right, the bottom of the onion comes out caramalised and the whole thing is absolutely delicious. Of course there are dozens of recipes for Vidalias, but that's one of our favourites for the summer. Not that we have a barbecue any more. In an apartment they are strictly verboten unless you have an electric one like our friends do. We generally use an indoor/outdoor grill and manage with that, but in this case we do our onions in the regular oven. Not quite as good I must admit, but not enough difference to be worth buying an electric barbecue for. So the Summer Olympics are over for another four years. We watched the closing ceremonies. They were pretty good too. The next ones are in London in 2012. I am trying to figure out how we can be in London at that time and also, how we can get tickets and for what. Come to that I am trying to wangle something for Vancouver in 2010. I tried out a new recipe last night. I thought it was OK, Matt thought it was very good. It's certainly simple enough to do. 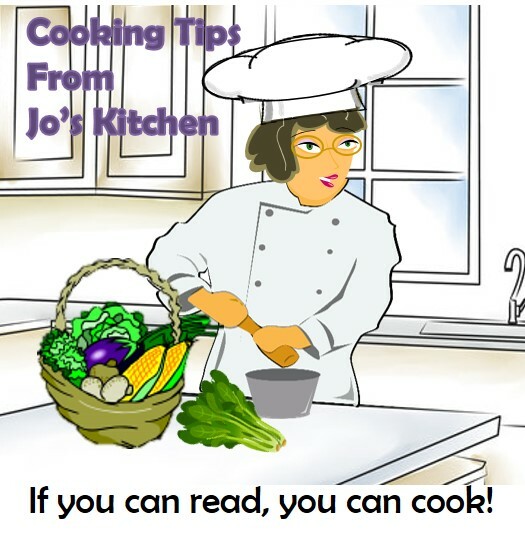 I picked up the recipe from Recipe du Jour which is an ezine I receive regularly. We served ours over rice. We had some Chèvre left over from the weekend which we tried with crackers. Much as I love it in the potato purée, I can't say I am enamoured with it as a cheese to eat on its own. Cook green pepper and onion in olive oil over medium-high heat until onion becomes translucent. Add chicken and continue cooking another 5 minutes, making sure to stir chicken so it cooks on all sides. Add remainder of ingredients and simmer about 10-12 minutes. Serve over rice or angel hair pasta. The Common Loon is a bird which is very much identified with Canada. To hear them calling across a still lake on a misty morning is one of the most wonderful sounds you can hear. It really conjures up Canadian Wilderness to me along with a wolf howl or two. If you would like to hear recordings of their different sounds go to Journey North and there are four short sound recordings. The wail and the yodel are the most familiar to me. The photo is of a loon in breeding plumage and was taken by Woody Hagge. I remember our very first vacation in Canada when we rented a camper/trailer and went up north. When we were close to Thunday Bay we stayed on a campsite where we rented a boat and went fishing. We got to Jesse Lake, first thing in the morning and you could hear the Loons calling across the water. The sun was just coming up and the lake looked like molten gold. Unfortunately all our pictures of this time are on slides so unless you come for a visit, I can't share them. 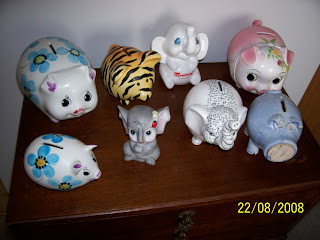 Yesterday I happened to show you my collection of Piggy Banks, we also have a collection of shot glasses. We had one or two and people decided we must be collecting them, so kept bringing us one back as a gift. We don't have that many, but it was an unintentional collection originally. Someone even managed to find one at Cape Canaveral with Matt's name on it. I'm afraid you can only just see it in the picture though. 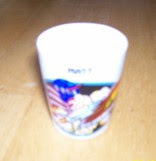 I even pick up the occasional shot glass myself now, they have to say something about where we are of course. Isn't it odd how collections start. I also tend to collect wolfie things. I have pictures, plates, plaques, you name it. My computer room/office is littered with wolf pictures plus I have a wolf calendar on the wall and another one in the kitchen. Funnily enough, I only have one dragon which was given to me at Christmas as part of a trinket dish. 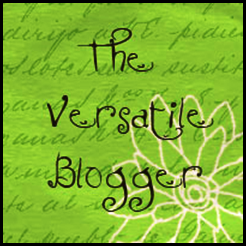 See my blog on January 11. At my age, I don't need to start collecting any more "stuff" anyway. 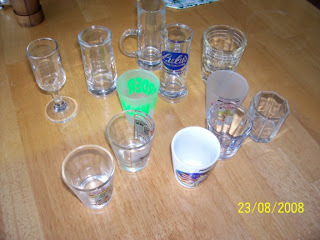 We have been thinking of downsizing our living accommodation and would need to get rid of a stack of junk possessions. Tonight, no cooking, we are going to dinner at a friend's home which will be fun. Our hostess is a very good cook. Another crèpe filling for you: Creole Shellfish Crèpes Serves: 6 Photo from anitasuess.com/crepes.jpg Cuisine: Creole Source: Cooking Light - May 1994 3/4 lb medium fresh unpeeled shrimp 1 tbs veg oil 1/2 cup diced celery 1/2 cup diced green pepper 1/2 cup diced onion 1/2 tsp dried oregano 1/2 tsp dried thyme 1 clove garlic, minced 1 cup undrained, canned, diced tomatoes 1-1/2 tsp tomato paste 1/4 lb bay scallops 1/4 cup chopped green onions 1/4 tsp salt 1/4 tsp black pepper 1/8 tsp ground red pepper 12 Cornmeal Crepes 1/2 cup shredded cheddar cheese 1/2 cup evaporated skimmed milk Peel and devein shrimp; set aside. Heat oil in a large nonstick skillet over medium heat until hot. Add celery and next 5 ingredients (through garlic). saute 5 mins. Add tomatoes and paste. Cook 5 mins stirring occasionally. Add shrimp and scallops, cook 2 mins (or until seafood is only partially done), stirring constantly. Spoon mixture into bowl, stir in green onions and three seasonings. Spoon 1/3 cup seafood down center of each crepe. Roll up and place seam side down in baking dish(es). Sprinkle cheese over the crepes, drizzle with milk. Cover and bake at 350 for 15 mins. Uncover; bake 10 mins or until heated. Have a great weekend. Saw a bit on Good Morning America today showing a family who spend less on groceries for 6, in a month, than I do in two weeks. They cut coupons and price shop. As Matt pointed out, what do they spend on magazines and newspapers to get all these coupons? In our own case, the only coupons we seem to get are for things we don't use or eat anyway, or how much laundry detergent can two people use? It didn't say what they buy generally, but the mother described buying chuck steak and grinding it yourself. No problem there except she mentioned including all the fat - not so healthy a choice. I rarely buy stuff which has been prepared which one often gets coupons for and which may be less expensive. North America seems to live on Kraft Macaroni and Cheese - I have seen people with shopping carts absolutely loaded with the stuff. Yes I know, not everyone buys it, but.... We prefer to try and buy foods in bulk from the wholesale stores, so we can freeze it or make up dishes and then freeze them. We also put all our change in piggy banks although since we moved into an apartment, we don't save so much because our quarters (25 ¢ coin) all go to the laundry money. Talking of coins, that was something confusing when we first got to Canada, I went out to buy a newspaper from a box one day and it told you how many dimes and quarters (or whatever the combination was) were required, I hadn't a clue of course. Turned out that you have quarters, dimes (10 ¢) nickels (5 ¢) and pennies (1 ¢) - these days we have Loonies ($1 coin) so called because its reverse side has a loon on it and Twonies ($2 or two Loonies). This picture taken from Life in the Minivan Lane. We can't save Loonies either because we use them for the laundry too. I promised crèpe fillings today and here is one. Cheesy Ham and Mushroom Crèpes Serves: 6 Source: Cooking Light - May 1994 Photo from Cooking Light. Ingredients: 1 tsp margarine 1 cup chopped onion 4 cups sliced fresh mushrooms (12 oz.) 3/4 cup plus 2 tbs evaporated skimmed milk, divided 1/2 cup beer 1 tbs cornstarch 1-1/4 cups lean ham (6 oz) 1 cup (4 oz) Swiss cheese 1/2 tsp salt 1/2 tsp pepper 12 Basic Crepes Melt margarine in a large nonstick skillet. Add onion and saute 2 mins. Add mushrooms, saute 2 mins. Add 1/2 cup milk and beer, cook 3 mins. Combine cornstarch and 2 tbs milk in a small bowl, stir well and add to skillet. Bring to a boil and cook 1 min stirring. Remove from heat, stir in ham, 1/2 cup cheese, salt and pepper. Spoon 1/4 cup mixture down center of each crepe and roll up. Place seam side down in a baking dish or individual gratin dishes. Sprinkle remaining cheese evenly. Drizzle remaining milk over crepes. Cover and bake at 350 for 15 mins. Uncover and bake another 15 mins or until thoroughly heated. Have a great day. I am pleased to report, if you didn't hear, that Usain Bolt did it. He broke the world record in the 200 metre by 2/100 of a second. He is absolutely fantastic. 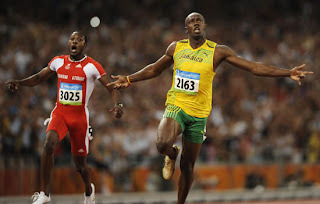 Did what no-one has done before by winning the 100 and 200 metre races in record times in the same meet. He was 22 yesterday so the crowd sang Happy Birthday to him. Matt says he has to compete in a relay yet. I wonder if he will have "enough" for the same races in four years time? Picture taken from CBC's Olympics Page. Steel Magnolias was very well done. I saw the film years ago, but for some reason, I hadn't remembered what a powerful story it was. The Drayton Festival players did a wonderful job. The whole play takes place in a beauty salon although I recall in the movie they moved to other scenes. When the final moment came with the mother being so angry about her daughter's death, you could have heard a pin drop. Then the relief came with gales of laughter. It was most impressive. Beautifully acted. One criticism was the hairdresser, Truvy, was trying to do a Dolly Parton and Dolly Parton she ain't. Why she didn't just interpret the part her own way I don't know. Also, not her fault, there were a couple of lines which referred to Dolly's endowments, which were somewhat misplaced with this actress, in fact with most other actresses. I am surprised the producer didn't cut them out. Picture taken from IMDB I was somewhat surprised to read in an ezine I take that people were actually donating money to the writer to help him buy a new computer. I can't figure out in my mind if this is being generous or stupid. 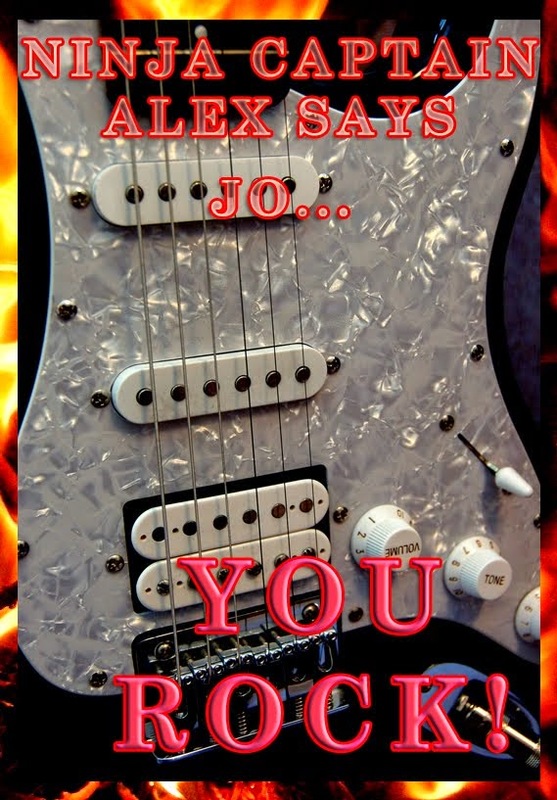 Admittedly he has been writing for a number of years and has become a great favourite with his readers, but..... Hey guys, I need a new computer, are you going to send me money to buy one? As usual I watched Nova Science Now, nearly didn't but it was chucking it down in Beijing so there wasn't a lot to watch. They are having a typhoon (hurricane) over there too and it is dropping lots of rain everywhere rather like Fay is over here. Theirs is called Nuri. They postponed several events, but I read today that the equestrian events in Hong Kong are going to go ahead. I appear to have missed the new stuff on the Nova programme and just watched some segments I had already seen. They were still interesting. There was one segment on retrieving tissue samples from T-Rex bones. 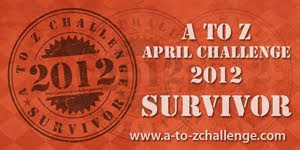 If you want to check the segments out click here you can also see the segments I missed earlier. Shopping day today, I haven't been for a couple of weeks, so need to get cracking. I was just reminded of the following recipe so thought I would share it with you. This is for different kinds of crèpes which can be filled with different foods. Tomorrow I will post suggested fillings. I particularly love the wholewheat crèpes, they taste so different. Crèpes Serves: 12 Source: Cooking Light - May 1994 1-1/4 cups flour 1-1/2 cups skim milk 1 tbs margarine or butter melted 1 egg Herb Crepes - add 1 tbs each of minced fresh parsley, oregano and basil to the milk. Parmesan - add 1/4 cup grated Parmesan to the flour Cornmeal: - replace 1/4 cup flour with 1/4 cup cornmeal. Wholewheat - replace 1/2 cup flour with 1/2 cup wholewheat flour and use 2 tbs margarine. Dessert Crepes: add 1 tbs sugar to the flour grated lemon rind (optional) Instructions: Place flour in a medium bowl. Combine milk, margarine and egg and add mixture to flour, stirring with a wire whisk until almost smooth. Cover batter and chil for 1 hour. Coat a non stick pan with spray and when hot pour in a scant 1/4 cup of the mixture. Tilt pan to spread. When the underside is done turn over and cook the other side. Place on a towel to cool. Can be layered in wax paper and frozen til needed. Last night we watched an absolutely fascinating documentary by Nova called The Storm That Drowned a City. 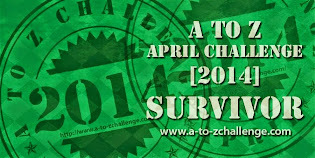 If you would like to see the video, it is here in six segments. The storm picturewas taken from one of the segments at PBS' Nova. It appears that the much vaunted levées were only built to withstand a category 3 storm, Katrina was Category 5. A year before Katrina the weather scientists had designed a computer model with Hurricane Pam as their subject. They had a seminar to show all the officials who would or should be involved, just what would happen if a Category 5 hit the area. However, it appears the message didn't properly "sink in" because when it happened, they were not prepared. A lot of problem has been caused because so much of the wetlands surrounding the original New Orleans was drained and more is being lost every day due to a number of causes all traceable back to the original draining and the levées along the Mississipi river banks. The river is no longer able to flood annually depositing a silt build up (similar to the Nile in Egypt) which helped protect from storm surges. I remember reports after the tsunami disaster in Asia, they said the places that suffered least were those areas which had not been developed by man and still had natural barriers against storm surges. This picture of the LA Wetlands was taken from PBS. It shows some of the area they were talking about. Some places seem to understand how important wetlands are, others do not. They are a major factory in a healthy eco system. I spent the afternoon at Canadian Diabetes and learned about gastropresis which is a major stomach and digestive problem which diabetics can get. Apparently digestive problems are a big problem with diabetics anyway. As though there wasn't enough to contend with. Apart from that, I did some work on the computer as I now have access to it. Then we discovered it wasn't connected to the printer so we had to get that problem sorted out. Not much of interest to me on the Olympics today, the men's 200 metre race I am waiting for takes place tomorrow apparently when I expect to see Bolt bolt. Sorry. This afternoon I am off to the theatre once again, this time to see Steel Magnolias. I did see the movie, but have totally forgotten what it was about which is a good thing. This is another trip to Drayton. Once again, on the Chinese theme of the Olympics, here is a recipe from my Chinese cookbook which I have on my computer. Beef And Broccoli Serves: 8 Picture from Kiki Rice Source: Plum Blossom 1 tsp garlic powder 1 tsp salt 2 tbs. plus 2 tsp. cornstarch 1 lb. beef tenderloin, cut into 1 1/2 in cubes 1 bunch broccoli 3/4 cup cooking oil 2/3 cup chicken stock (see wonton soup recipe) 2 tbs. soy sauce 2 dashes tabasco sauce 2 eggs Make a mixture of the garlic powder, salt, 2 tbs cornstarch, and eggs. Stir in the beef, coating thoroughly. Marinate 5 minutes. Separate the broccoli into florets, leaving sections of stalk attached. Cook 3 minutes in lightly salted boiling water. Remove and keep hot. Heat a wok or skillet and add the cooking oil. When oil is hot, cook the beef about 1 minute, or until browned, stirring constantly. Drain off the cooking oil. Add chicken stock, soy sauce, and Tabasco sauce and return to heat. Dissolve the remaining cornstarch in 1 tbs. cold water aqnd stir into the beef mixture to form a sauce. Immediately place the beef in the center of a serving platter and surround with broccoli. Serve hot. Have a great day. 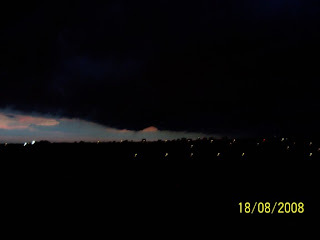 It was just about 8 p.m. last night when we suddenly saw black clouds forming in the sky. It was really quite frightening, I was certainly thinking of tornadoes. I took a couple of pictures to share with you. In the end, the black clouds seemed to descend over everything and we then got rain, lightening and lots of long rolling thunder. 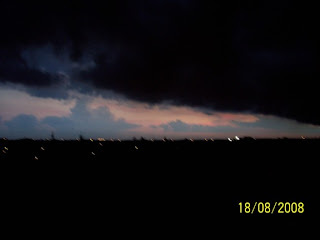 We never did see the lighter sky again, by the time it was all over, it was well and truly dark. We actually didn't get as much rain as we thought, it kept stopping and starting. Most peculiar weather. The whole landscape was just completely blacked out. This afternoon I am off to Canadian Diabetes again, they now have me properly set up on their computer so I can work away without interfering with anyone else's access. Needless to say, we were watching more Olympics yesterday, Usain Bolt ran his heat in the 200 metre as though he were out on a Sunday afternoon jog. One of the Canadian runners said he thought Bolt came from another planet, he also said Bolt could turn cartwheels and still win. I think the final is run today. Canada was excited to pick up two more silvers yesterday, one in equestrian and one in trampoline. The picture is from CBC showing Canada's Karen Cockburn the trampoline silver medalist. We also watched the individual performances on the rings and Matt was oohing in pain, I think. He knows that what they do these days just cannot be done even while he is watching them do it. The Chinese are very good. We watched the women on the uneven bars and I do so agree, I don't think the Chinese girl who won can have been much above 12. She sure didn't look even vaguely like a 16 yr. old. The TV programme introductions have a super dragon in them, you know me and dragons. I wish I could get a copy of it. It swirls and swoops on the screen as the programme starts. Canada, by the way, seems to be doing pretty well in rowing and kayaking although these events haven't finished yet. Then, there was the triathlon. One of the best finishes I have ever seen, I was jumping up and down in my seat. The Canadian, Simon Whitfield, was keeping up with the pack the whole way through, but never seemed to be really in medal contention. A young British guy was also well up in the pack too, his first ever triathlon and he ended up in 12th place. Very good. He was even leading the pack for a while. Right at the end, Whitfield dropped back a little, then caught up, then dropped back a bit more and still caught up. Finally he dropped back so far we figured he was out of it but suddenly he started to sprint, talk about exciting. 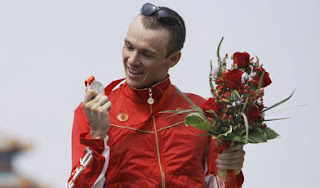 He passed everyone and was almost at the finish line when the German Jan Frodeno sprinted past him and took the gold. What a finish though. One of the best I've seen. Picture taken from the CBC Olympics pages. CBC called it a furious rally. It certainly was. If you would enjoy the video, it is here Matt, right now, is watching gymnastics and I am waiting for the men's 200 metre as I want to see what Bolt does in the finals. Don't know if its this morning or we will see it tonight. I thought I would give you another Chinese recipe. Hot and Sour Soup, which is one of my favourites. The local Mandarins (a chain of restaurants here) does an absolutely wonderful one. I decided to find one on the internet and came across this one which is a heart healthy version from the Heart and Stroke Foundation. I've even included their nutritional information. Obviously I have no idea what this recipe tastes like, I might give it a go later this week. This traditional soup usually contains a lot of salt. Try this low-sodium version at your Chinese New Year celebration. Place dried mushrooms in a small bowl and add 2 cups of boiling water. Let soak for 15 minutes. Remove mushrooms and add the water to the soup pot. Finely dice the mushrooms and add to the soup pot. Add pork, tofu, stock, water, ginger root, bamboo shoots, vinegar, soy sauce, Chinese 5 Spice and black pepper to the soup pot. Cook over medium heat for 25 minutes. Reduce heat to low. Discard the ginger root and add the green onions and sesame oil. Slowly add the egg whites while stirring. Add chili oil (if using) and serve immediately. 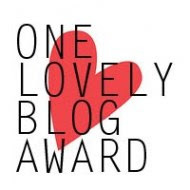 Developed by Nadine Day. ©The Heart and Stroke Foundation. Over the weekend we watched Usain Bolt "stroll" the 100 metres. The Jamaicans have got these races sewn up this year, quite incredible they way they are running. The female runner in the 100 metre did the same thing as Bolt, stopped trying before they got to the end. They could see they had the race wrapped up. Bolt still got a new world record out of it though. I don't know what any of you have available, but if you click here you can find videos of the events. This picture from the International Herald Tribune shows him already relaxing close to the finish line. His specialty is supposed to be the 200 metre which I believe is on TV today. Canada has finally picked up a few more medals and I see the UK have picked up a few too. We are curious at how many British swimmers are actually from Scotland with one from Wales. Don't the English swim any more? We had friends to dinner last night and they brought a bottle of Sangria which we chilled, then poured into a bowl (seem to have lost my pitcher) and added a load of fruit and a dollop of brandy. We drank/ate it with the orange cake which I had made. It was a very good Sangria. My head is aching a bit this morning, I wonder why? 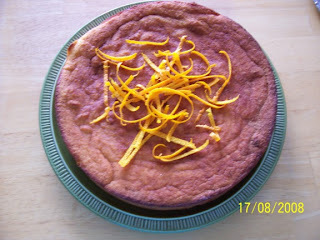 I was really pleased with my Turkish Orange Cake, it was one of the best I have made. I even took a picture of it for you all to see. We started with a shrimp cocktail, had a North Carolina type London Broil with goat cheese potato purée and French cut green beans. I have posted all these recipes at one time or another. Over the weekend I started thinking about another dessert cake I used to make many years ago. Don't know if any of my English readers will remember Fanny Cradock, she was one of the first TV cooks and her husband, Johnny, recommended the wines. (Mind you she treated him like dirt). She was always dressed up when she cooked never wore an apron or anything. Obviously most of the prep work was done for her, but she cooked and handled things that I would have wanted to wear an apron for. This picture was from the Daily Mail. Looking for it, I discovered quite a few scathing comments about her, I gather she was not very popular with the people she worked with. Someone also wrote that her cooking was impossible for a home cook. Sorry, I disagree, I made a lot of her recipes. Once you had watched them, it was usually pretty easy to do the same things. I find that with most cooking shows, I might not want to do some of their recipes if I just read them, but seeing it made makes it so much simpler to follow. I made marzipan roses having seen her do it, they are actually very easy and once you have them, you can keep them for a long time properly stored. I used to keep a whole bunch of them and use them for decorating all kinds of desserts. I must admit I haven't made any for years, I read the recipe yesterday and it isn't difficult. Fanny Cradock used to make the marzipan too, but I bought mine, coloured it and then shaped it. I would often make her Gateau L'Ambassadeur (Ambassador's Cake) and decorate the cake with the marzipan roses. The picture shown doesn't have the roses although it does have some around the base of the cake. The picture was borrowed from byhecks.info/Cookies.html Gateau l'Ambassadeur Fanny Cradock 1/2 lb best possible chocolate (70% or higher if you can get it) 3 1/2 oz. sifted icing sugar (confectioner's sugar) 3 tbs double cream (heaviest cream you can get in North America, probably whipping cream) 2 eggs, separated 2 oz peeled grapes 3 tbs kirsch 1 tbs water 3 1/2 oz unsalted butter 3 1/2 oz crumbled petit beurre biscuits (cookies) Place biscuits in a small bowl, add kirsch and leave to infuse. Place water and chocolate in a small, thick pan and dissolve over a low heat. Stir well until quite smooth, then remove from heat. Cut the butter into small flakes and stir into the chocolate until completely dissolved. Add the egg yolks and beat until mixture is again smooth. Stir in the sugar, blend thoroughly, add stiffly whipped egg whites and beat (I would have thought fold, but she says beat) them in until they vanish. Add the soaked biscuits and grapes. Finally add the cream. Turn into a 5" oiled, sliding-based cake tin, being careful to line the base with a fitting circle of oiled greaseproof (waxed) paper. Refrigerate until set, turn out, remove paper and garnish. Have a great day.